Who is entertaining on Thanksgiving this year? My sister is having it at her house and we can’t wait to all be together. 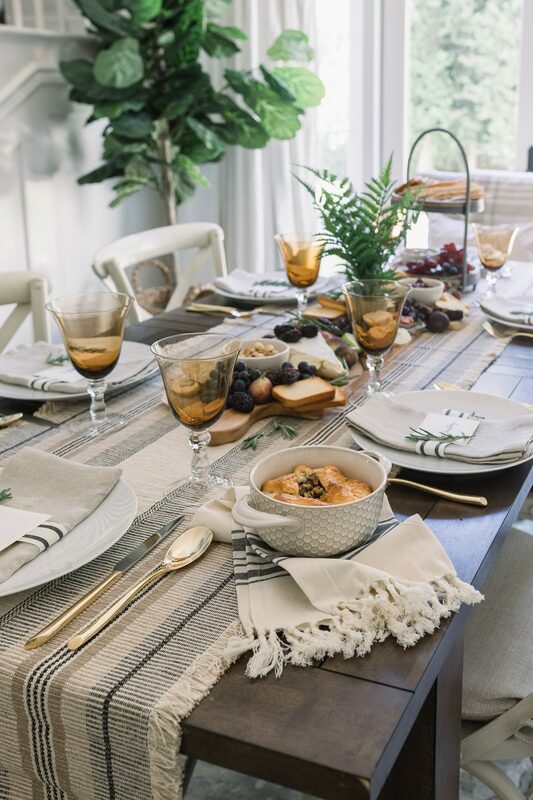 I thought it would be fun to share a Fall table idea for those of us not hosting. It’s actually my favorite weekend to have friends over because it isn’t as chaotic as Christmas time. It’s just a wonderful time of year to be with people you love. 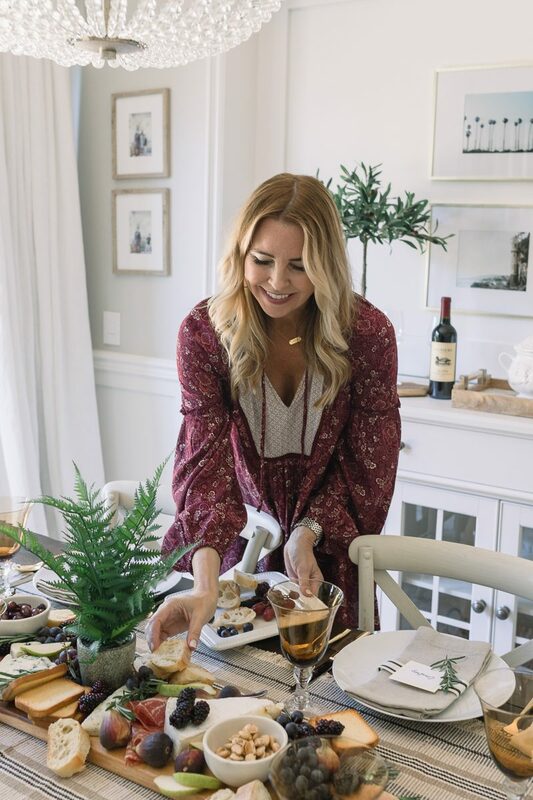 Whether you are hosting the big event or just wanting to invite over an intimate group, I teamed up with World Market to share a few simple ideas that will make your evening much easier. First and foremost, create an atmosphere with things you love. When I first saw the olive trees I had to have them. There is something about them that makes me so happy. 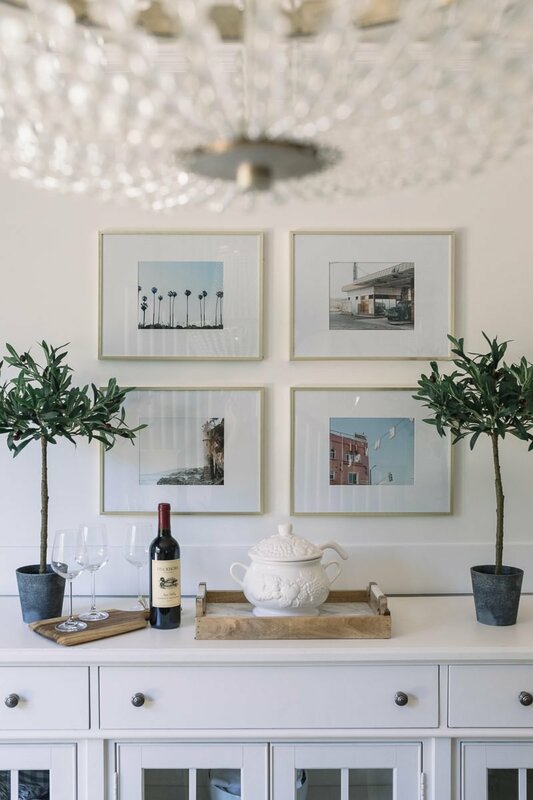 I make a point of telling you this because if you buy pieces you truly like, you will use them year round and in different places in your home. These could easily be part of the tablescape or used on a mantel. Fall is the perfect time to break out all of your neutral pieces. 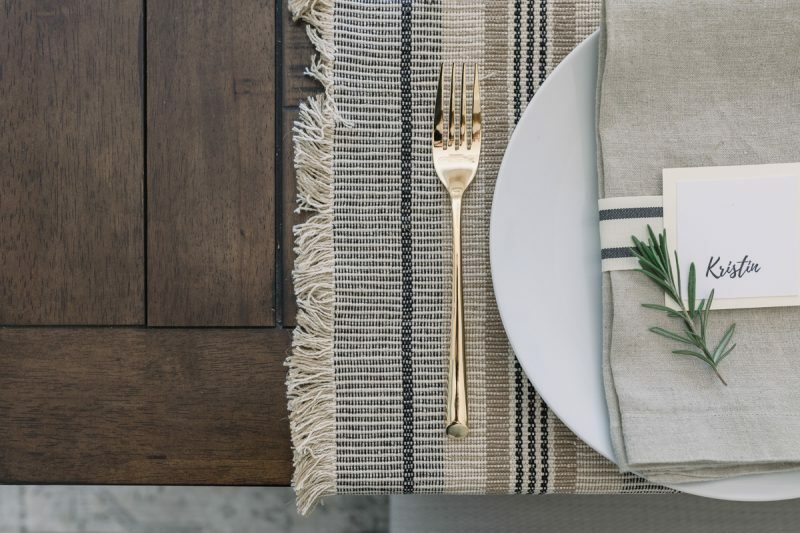 From cutting boards, to napkins, to the runner. This allows you to use white dishes and add color with food and greenery. It’s also easy to mix and match when you stick to a neutral color scheme. 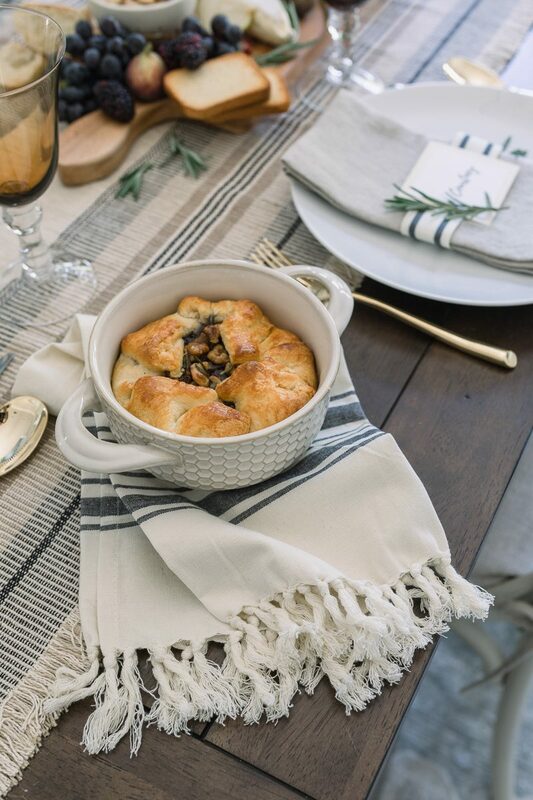 These linen napkins are versatile and will work year-round. This oversized runner is a new addition and I haven’t taken it off of our table. The colors, strips and texture are so good. 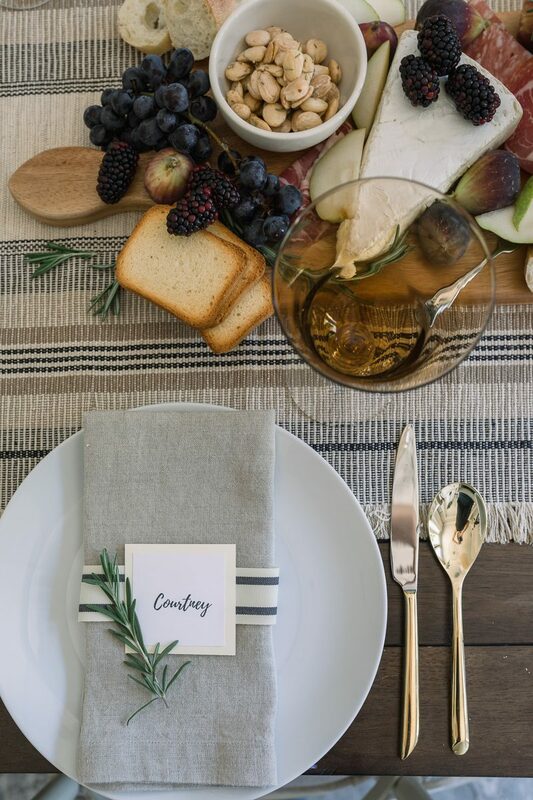 Even if it’s a really casual setting, you can still add a place card. I printed these on my computer but I love the way a hand written names looks. It can be so simple but when you add a touch of ribbon and a piece of fresh rosemary you suddenly have something much more special. At a loss for a centerpiece? Think food! I set this table intending to have over two other couples. Wine, charcuterie and a couple more appetizers. What more do you need? You could scale this for a larger gathering depending on your plans. 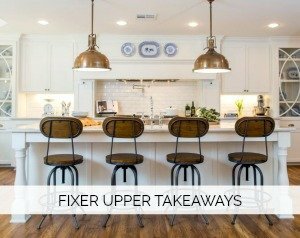 It creates such a warm and inviting look and the food is at your fingertips. Just layer it all on a long, beautiful cutting board. Don’t overthink creating the charcuterie board. Start with your cheeses and then layer in the meats. After that add your fruit and crackers. Overlap items and fill in with rosemary. There are no rules. If your are still unsure, check out this video I made. I often hear from my friends that they don’t want to entertain because they can’t cook. No need. Keep it simple. The charcuterie tray is all from the market and appetizers don’t take a ton of skill or time. 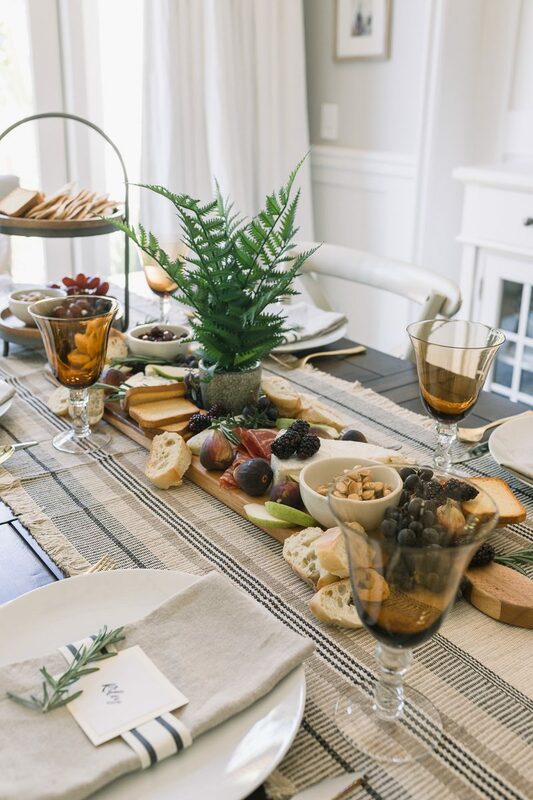 Whether it’s faux or real, greenery adds warmth and interest to your table. I like to incorporate fresh greens from the yard whenever possible. Using rosemary on the table and at each person’s place smells amazing. Buying fresh herbs and the store won’t break the bank but adds so much charm. 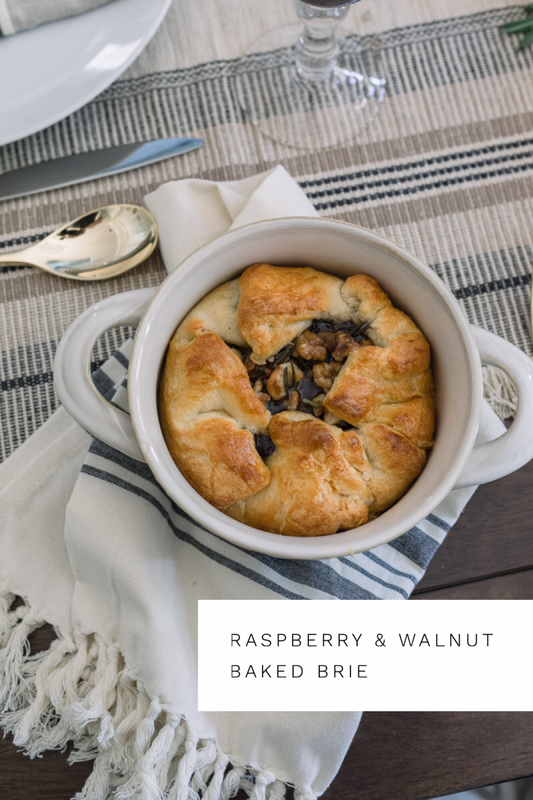 No matter what your menu might be, always incorporate something warm and scrumptious. 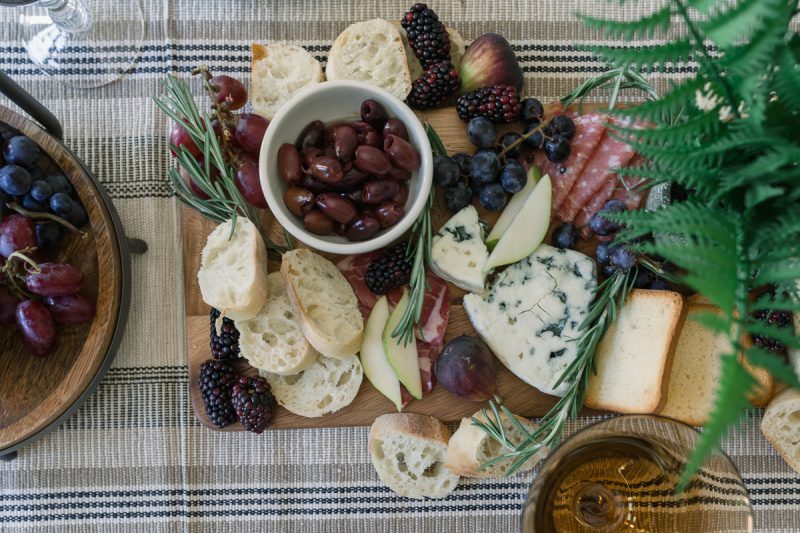 For an easy Fall night like this, the charcuterie centerpiece can be accompanied by a few more appetizers. This brie dish is remarkably simple and always a crowd pleaser. I used a soup crock to add that Fall touch (currently on sale). 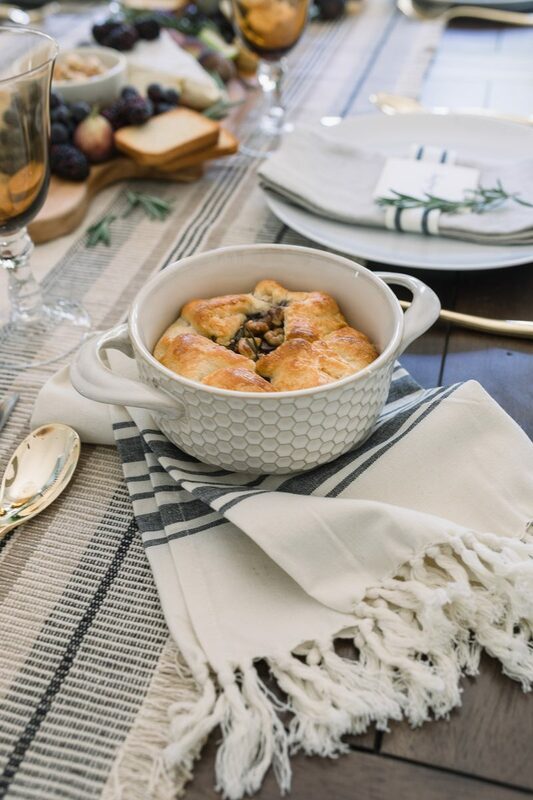 Spread out crescent roll dough on a parchment lined cookie sheet and place brie wheel in the center. Spread raspberry preserves over the top of the cheese. Sprinkle with toasted walnuts and rosemary. Fold dough up and around the brie wheel. Do not cover completely. Beat one egg and wash over the top of the dough. Serve with crackers. This can also be cut into pie shaped pieces and served as individual portions. It's good enough to eat on it's own without crackers. *After baking the brie, I slipped it into this soup crock. It fits perfectly and looks so festive for Fall. Lastly, if friends offer to bring something say yes! I used to turn down the offers and now I embrace them. Why not lighten the load? Plus we all know we feel better if we contribute. It makes everyone feel a part of the evening. Whether it’s dessert, wine or another appetizer, accept the gracious offer. 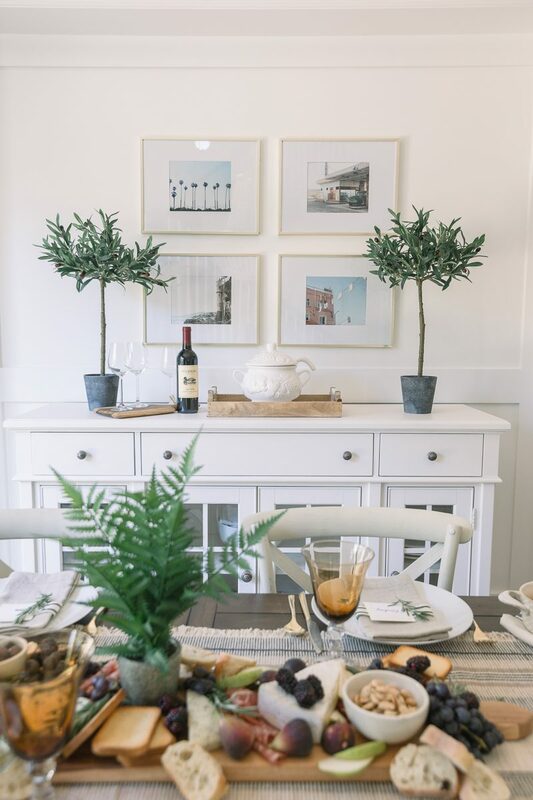 To add height to your table, you can always incorporate a two-tiered stand. I like the warmth of this one. Plus it’s a piece I can use over and over again. I love each one of these pieces. World Market has gorgeous holiday finds right now. I stocked up on that striped ribbon. Just too good to pass up. The soup crocks can be used for so many different things. The texture and color are both so lovely. Bottom line . . . throw your hang-ups out the window and invite your friends over. All of us feel the same way. Maybe our house isn’t big enough, clean enough, nice enough, etc. And yet when we get invited over to be with friends those are the last things we are thinking about. We just enjoy being together. If nothing else, I hope you push yourself to host one night that you normally wouldn’t. Hospitality doesn’t have to be formal or fancy, just genuine and welcoming. This is the time of year that we all do so much more cooking. Have you swapped out your old non-stick pans for new ones? We are in the process. 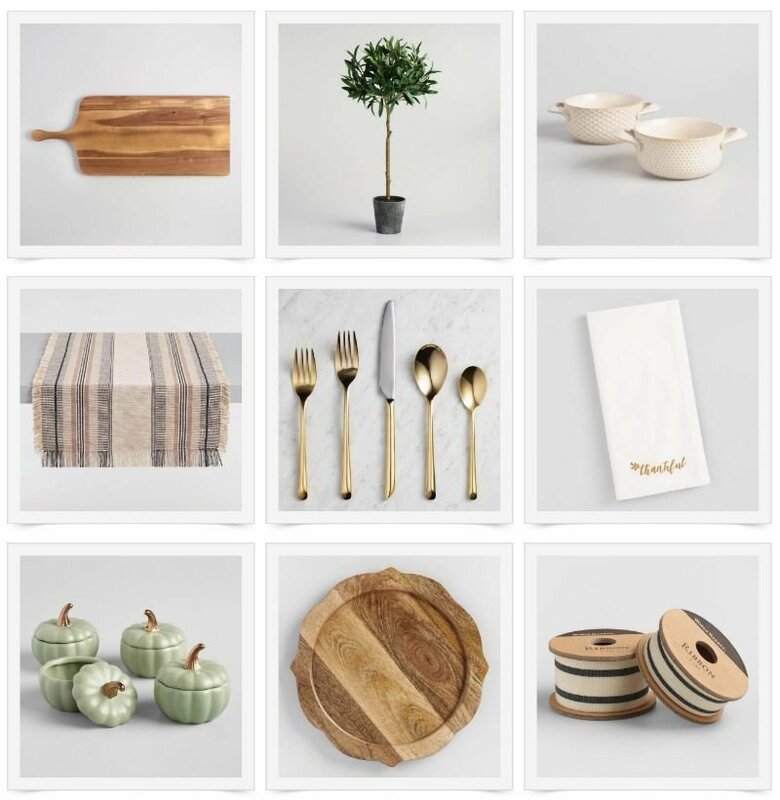 World Market just launched their line of Green-Pan products in case you hadn’t heard. They are non-stick, non-toxic and scratch resistant. Here’s to keep things simple and inviting this holiday season. Enjoy the day, friends. *Proud to partner with World Market. Affiliate links used. This is GORGEOUS. Just the inspiration I need to get my table updated this year. Great job! Thank you so much, Meagan! I am so happy it sparked some ideas. Enjoy the week. Thanks for stopping by. I love that runner! Right up my alley. I just offered to host Thanksgiving for my side of the family. We will see if my mom takes me up on it. I love to host happy hour! Inviting people from different parts of my life makes for interesting conversation. I found hosting dinner parties or big cocktail parties was too stressful, too much work, too time consuming and expensive so now I host small groups and get to enjoy myself. I’m always on the look out for new recipes and since cheese & raspberry preserves are a favourite combo of mine, I’ll be making your recipe. It’s already printed out for this Friday night. I love your little olive trees. Too cute! Thanks for the inspiration! I’m hosting a mid-Nov book club and the charcuterie and brie will be perfect for something different. We usually host a dinner, so maybe a butternut squash soup and/or salad will round it out. Yay! I’ve got my menu planned and it’s not even Nov! You wrote this for ME, didn’t you? You nailed this whole thing AND you described completely, exactly how I feel about entertaining- I don’t feel comfortable cooking, I don’t know what I’m doing, Is this wine ‘good enough for guests’? My house isn’t ‘perfect’ enough. What if they think this is a dumb idea? But yet, when I go to someone’s home I would never think those things about THEIR home or what they had planned to serve! I guess I should give myself credit and think about the possibility that maybe I AM good at choosing friends who DON’T judge me! Thanks for sharing how perfectly lovely even a simple plan can be. I might actually think about doing this! These are some of my favorite posts that you do. 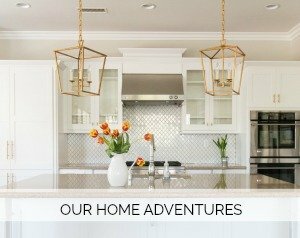 Your entertaining style is simple and elegant, but also fresh and modern. So much inspiration! Thank you!